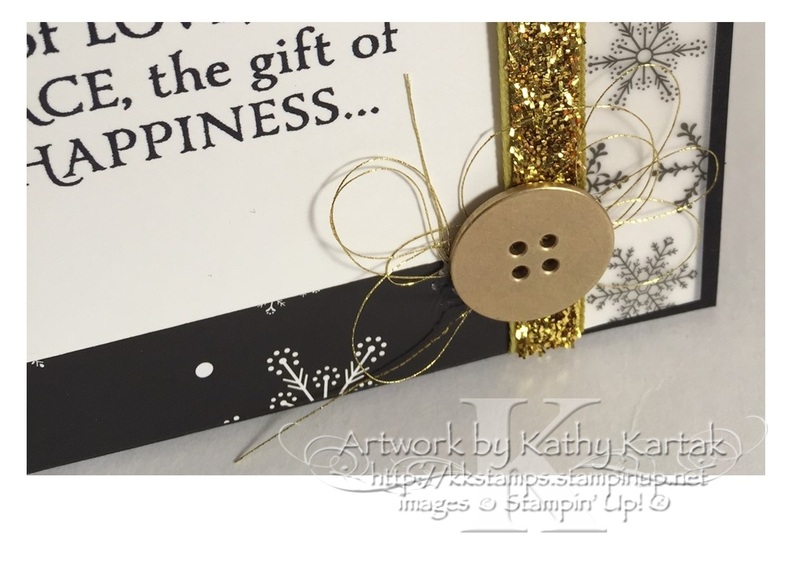 #stampinup This is going to be the last blog post for 2015. I'm going to take a couple of weeks off from blogging over the holidays to spend time with my family. I want to thank everyone who has followed my blog and who has commented on the blog or on Facebook or on Twitter or on Instagram or on Splitcoaststampers. Your comments brighten my day and make me feel like I do have a smidgen of creativity. I hope my blog and my creations inspire YOU to be creative, too. I'll be back on Sunday January 3, 2016 with a blog stop on the Creation Station blog hop. We'll be featuring our favorite sets from the upcoming Occasions catalog (January 4 - May 31, 2016). We have some amazing artists on our Creation Station blog hop--including a couple of Stampin' Up Artisans. So make plans to stop on by! Speaking of amazing artists, my daughter's French class had an assignment to create a winter card to give to a classmate. I wanted to share her creation with you. She's a Stampin' Up Artisan in the making! My darling daughter started with a Night of Navy card base and added a Soft Sky mat. 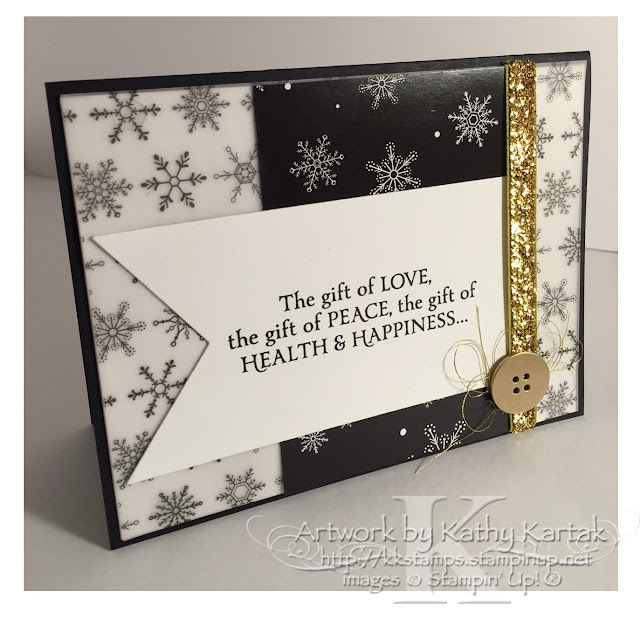 Then she embossed a Whisper White panel with the Softly Falling Embossing folder. She stamped two trees from the "Festival of Trees" stamp set in Night of Navy onto Whisper White and punched them out with the Tree Punch. She added stars punched from Silver Foil with the star punch from the Itty Bitty Accents Punch Pack. She tied several lengths of Silver 1/8" Ribbon around the card and added Basic Pearls to the Tree. She punched a Soft Sky label with the Decorative Label Punch and another Night of Navy label to back the first--she cut the Night of Navy in half. The sentiment, "Mereilles d'Hiver" means "Winter Wonderland" and I think she did a wonderful job, don't you? Merry Christmas to you and your family! I hope you have a healthy and happy new year! See you in 2016! Wanna see a sample? OK. I'm going to cheat a little and use one of the make-and-take items from November's On Stage Local event, but that's OK, right? It's probably new to you! This card features the totally awesome Bloomin' Heart Thinlits Die. We cut out the heart from a striped Crumb Cake piece of the Love Blossoms Designer Series Paper stack and then stamped the flowers from the coordinating "Bloomin' Love" stamp set in Blushing Bride. I adhered the heart to a Rose Red panel with the Fine-Tip Glue Pen. Then I wrapped with some Blushing Bride 1/4" Cotton Ribbon around the panel before adhering it to a Crumb Cake card base. 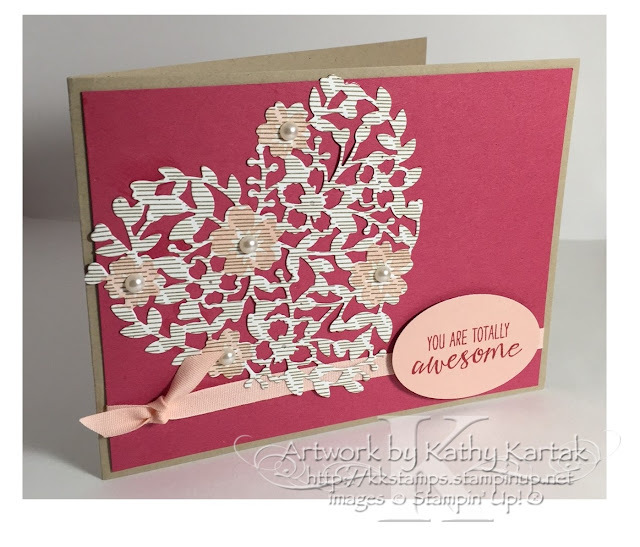 I stamped a sentiment from the "Grateful Bunch" stamp set in Rose Red onto a Blushing Bride scrap and punched it out with the Large Oval Punch. I adhered the sentiment to the card with Stampin' Dimensionals. I added a little pizzazz to the card with some strategically placed Basic Pearls Embellishments. It's not too early to schedule your Sale-a-Bration event with me. SAB starts on January 4th and runs through March 31st. Some of the SAB items are only available for the first half of the SAB period--and they'll be introducing new SAB items for the second half. So, you could schedule TWO SAB events with me!!! Just click on the "contact me" link under the banner and send me an email or give me a call. Lines are open!! 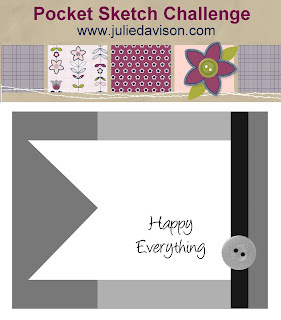 #stampinup I subscribe to Julie's (Davison) Stamping Spot because Julie has such creative ideas. I'm always finding ideas to CASE. Julie is an amazing paper-crafter! When I opened today's email, I saw a simple layout that was easy to CASE--and, glory be!--Julie is hosting a challenge! You know I'm a sucker for a challenge! I started out in a different direction, using different Christmas designer series paper, but before I got too far, I decided I didn't like it. So, I opted, instead, to use the gorgeous Winter Wonderland Specialty Series Paper and the Winter Wonderland Vellum Stack. I cut a Basic Black card base and a Whisper White panel. I cut a piece of Winter Wonderland Vellum the same size as the Whisper White panel and adhered it with some strategically placed Glue Dots. Then I added a 3" x 4-1/4" piece of Winter Wonderland Specialty Series Paper and wrapped a length of Gold Glitter Ribbon around. I stamped a sentiment from the "Versatile Christmas" set in Basic Black Archival Ink on Whisper White and cut out the banner with the second largest Banner Framelit. To finish the design. I wound some Gold Metallic Thread around my fingers and adhered it to the card. I added a Basic Gold Button with a couple of Glue Dots. Here's a close up of the button and gold thread. I think these papers and ribbons are so beautiful! I'm going to be sad when they retire soon!